Can you believe Christmas is just around the corner? It’s time to get out your sweater stash and make some fun things for the holidays. 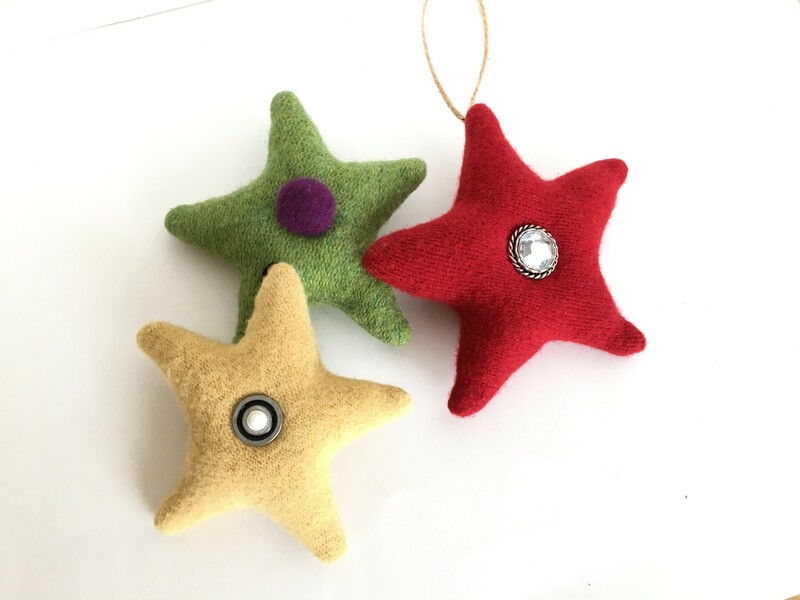 These upcycled sweater stars are so simple to make and can be embellished in so many ways. Hang them from a door knob, embellish a gift package, put them on your Christmas tree, or just simply set a few on a shelf. Depending on what sweater or other material you use, each one will sew up a little differently. That is what makes them so fun to make. Mix and match colors, textures, buttons and balls to your hearts content. I was so excited to find this yellow sweater at the thrift store one day. A yellow wool sweater is always a good find. They are rare and hard to find. It was the perfect sweater for a warm, holiday star! If you would like some tips on how to felt wool sweaters and how to get them ready for craft projects, I have a FREE online video class. You can read more about it HERE. Embellishments (optional) buttons, jingle bells, sweater balls, etc. 1- Download, print and cut out pattern. 2- Cut two stars out of the fabric of your choice. 3- Place star pieces Right Sides Together (RST) and pin in place. 4- Starting at one star point, backstitch and then sew around stopping where indicated to leave space for filling. 6- Clip star tips and inside corners. Poke star tips out using the tips of scissors, or a wood turning tool. This is the polyester fiber fill that I use. As you can see, I buy it in the big bag to have on hand for all my crafting adventures. 8- Stuff the star, poking the fiber filling out into the star tips. Use a turning tool or the tips of a pair of closed scissors. (only if they have a rounded tip). Be careful not to poke through the fabric! 9- Double thread a needle and knot the end. 10- Sew the opening closed using a slip stitch. Tuck, stuff and fold as you sew. Fold tip over and tuck in sides to form a tip. Sew all the way to the end and knot. 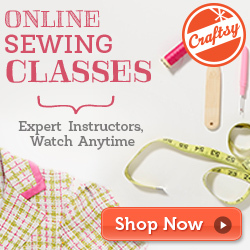 You can watch a demonstration of how to sew the slip stitch HERE. 10- To make indent in the middle (optional) double thread a needle and knot the end. Making a dimple or indent in the star, makes it easier to place a button or bell on the front of the star. 11- Stick the needle in the back and pull through into the inside. 12- Stitch back and forth through both layers several times, pulling tight to form a dimple. Here are a few ideas of what you can use to embellish your star. 13- Sew or glue, the button, bell or sweater ball to the star. Here are some options of what to use to hang your star. Cut a strip of yarn, embroidery floss, ribbon, jute, etc. about 10 inches long. Fold in half and make a knot on the end. 15- Using a needle and thread, whip stitch the knotted area onto the end of a star tip. I bet you can’t wait to whip up a bunch more! These sweater stars would be a fun Thanksgiving craft. Someone in my family usually comes up with a simple craft for all of us to make while we sit and chat. I wonder what we’ll make this year? I will have to keep you posted. Send me a note if you have any questions while sewing up your stars. You can find other fun things to make with upcycled wool sweaters in my Etsy shop and my Craftsy shop. This is a great time to get started on your Christmas gift making. Here are a few other ideas.